Coming Home 1978 - 128 min. 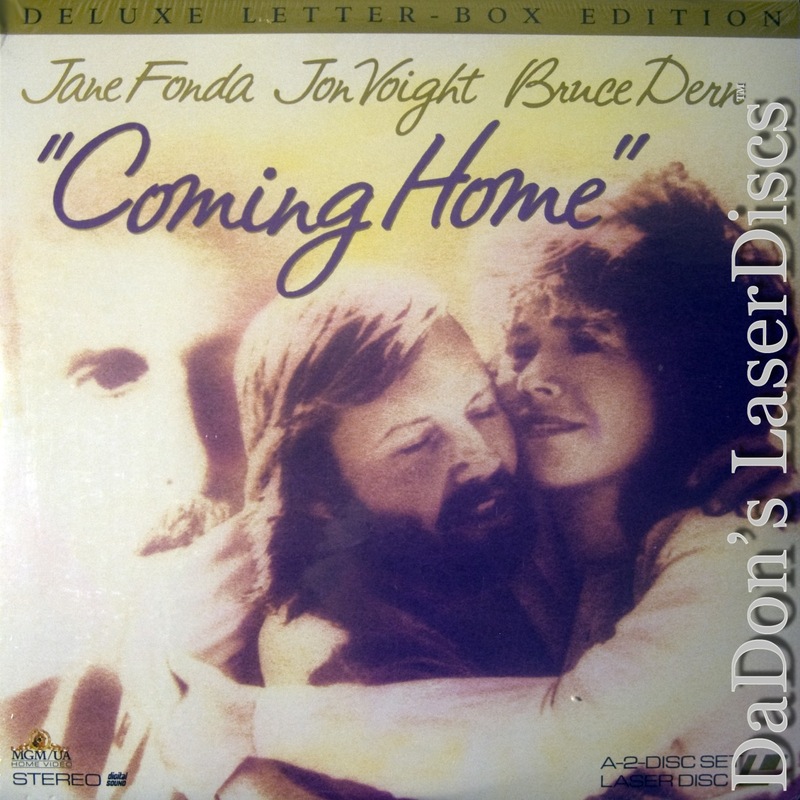 - Color Genre: Drama Rated R Country: USA LaserDisc Movie Storyline: When Sally Hyde's (Jane Fonda) husband, a ramrod-straight marine captain, Bob Hyde (Bruce Dern), is sent to Vietnam, she leaves the isolated world of the officer's quarters and begins volunteer social work at the veterans hospital. There her unthinking support of the war and her blindness to its effects are challenged by meeting the crippled men struggling to recover, psychologically as well as physically, from their time in country. Many, like Luke Martin (Jon Voight), now a paraplegic, are embittered and full of unfocused, uncontrollable rage, which he takes out on the prim, controlled Sally. Interestingly, they went to the same large high school, but she was a pretty, popular cheerleader type and he was just a guy in the back of the class. Gradually, as she changes politically (always signaled by changes in hair and fashion) and he recovers emotionally, they become friends and then lovers. This causes a sexual awakening in Sally that furthers her transformation from a repressed wife to an independent woman. Then her husband comes home. Hal Ashby's film, with its classic rock soundtrack and lush photography by Haskell Wexler, submerged its politics in a warm nostalgia, although it was made just a few years after the war ended. Still, its theme of individual transformation, both political and sexual, struck a chord with baby boomer audiences who all felt, to varying degrees, that they had done the same thing. 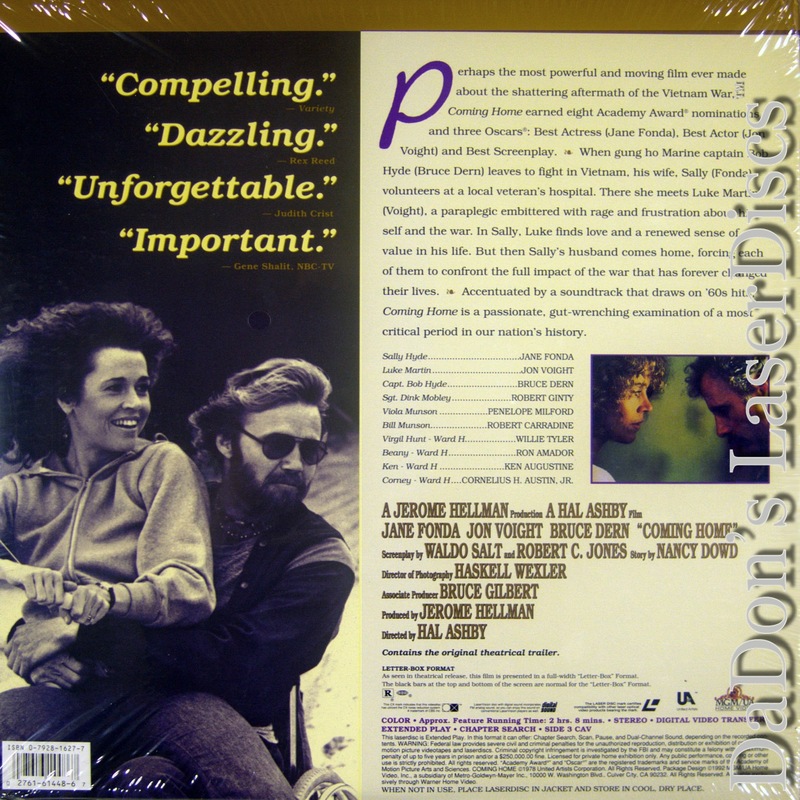 LaserDisc Movie Review: Hal Ashby's 1978 melodrama examines the impact of the Vietnam War on the "war at home" among the men who fought it and the women in their lives. Left alone in Los Angeles when her gung-ho Marine husband Bob (Bruce Dern) heads to Vietnam in 1968, proper wife Sally Hyde (Jane Fonda) decides to volunteer at the V.A. hospital where her new friend Vi (Penelope Milford) works. There she meets Luke Martin (Jon Voight), a former high-school classmate and Marine who has returned from 'Nam a bitter paraplegic. As their relationship grows, Sally sees the effect of the war on the soldiers after they come back, inspiring her to rethink her priorities; Luke's spirits begin to lift, and a hospital tragedy helps focus his anger toward meaningful protest. After a Hong Kong visit with her increasingly withdrawn husband, Sally finds a love and companionship with Luke that she had never known with her husband. Once Bob comes home with his own injury, however, the three must find a way to deal with a changing world and with a system that betrayed the men fighting for it. [Synopsis by Lucia Bozzola] Originating as a project for Jane Fonda's production company, Coming Home took five years to get made, but it was still part of the first wave of Hollywood movies to address the controversial Vietnam War. With the presence of outspoken antiwar activist "Hanoi Jane" as the star, and fellow activist Haskell Wexler behind the camera, Coming Home espoused a clear antiwar stance, personalized through the characters' coming to consciousness over the war's toll. The cinema verite shooting style, particularly in the opening scene of vets discussing whether they'd fight again if they were able, enhances the story's intimacy. No one experiences the war the same way, but no one comes away unscathed. Coming Home was praised for its sensitive performances, Jon Voight won the New York Film Critics Circle prize for Best Actor, and it was nominated for eight Oscars, but it was quickly overshadowed by Michael Cimino's more inflammatory Vietnam epic The Deer Hunter. Still, although The Deer Hunter won Best Picture, Fonda and Voight won Best Actress and Best Actor, and Nancy Dowd, Waldo Salt, and Robert C. Jones won an Oscar for their screenplay. By leaving the fighting offscreen and the ending ambiguous, Coming Home potently captured the elusive yet irreversible psychological disruption in the wake of Vietnam. [Review by Lucia Bozzola] Thanks for Visiting DaDon's Rare LaserDiscs ! Reviews, Articles, Newsletter and Information for Movies on LaserDisc LD Laser Disc, LazerDisc.